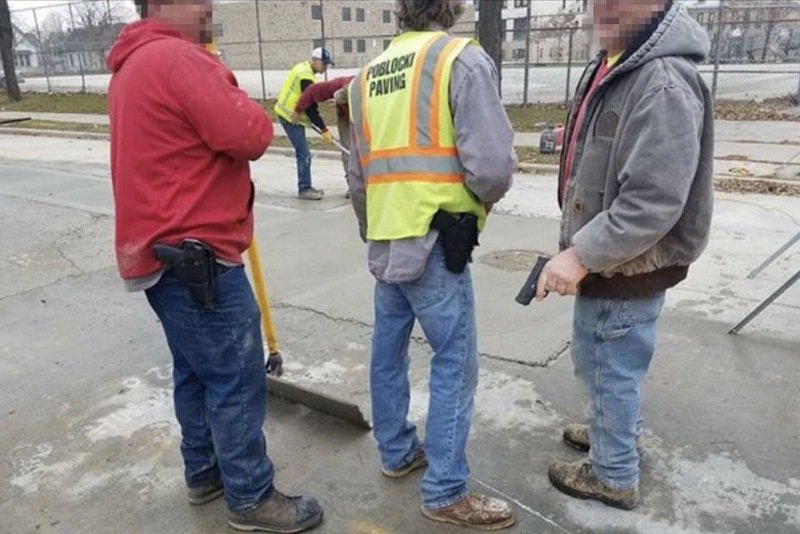 This photo of three American Sewer Services employees carrying guns while working on a project for the city of Milwaukee on 19th and Meinecke streets was shared widely on social media and angered several Common Council members. While several Milwaukee Common Council members said they are determined to prohibit city contractors from carrying weapons on the job, public officials mirrored the social media reaction to an online photo of three contractors carrying guns posted over the weekend. Some Common Council members find it offensive that three men, who presumably do not live in the North Side neighborhood where they were working, would feel so unsafe that they would arm themselves and flaunt their weapons. Others said that it is understandable why they might feel they need to carry a weapon, given Milwaukee’s public safety issues. Those perspectives leapt off computer screens and mobile devices and appeared front and center during a Public Works Committee hearing Wednesday, when council members got a chance to question the head of the Public Works Department about the photo. It featured three white sewer contractors openly carrying guns while on the job near the intersection of 19th and Meinecke streets, a predominantly black neighborhood. Two men had their guns holstered, while the third held the weapon in his hand. The photo has raised questions about whether city contractors can or should be prohibited from carrying weapons while on the job, even if they feel unsafe. “Would any of you spend your day at 19th and Meineke unarmed?” read one Twitter post. “If we did this [in a] white neighborhood we would be arrested, shot or killed,” read a comment on Facebook. But the photo also prompted a discussion about Milwaukee’s real and perceived public safety challenges. As Ald. Milele Coggs pointed out at the meeting, the dialogue is falling along racial lines. Wednesday’s meeting became somewhat heated after Ald. Bob Donovan — while repeatedly saying he was not defending the men in the photo — expressed that many people outside of Milwaukee view the city as a “war zone,” a phrase seen multiple times in the online reaction to the photo. 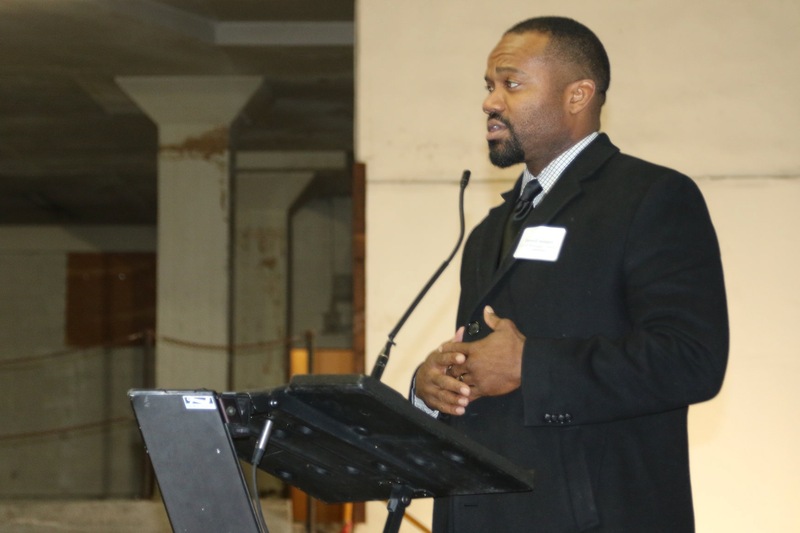 He referenced Legislative Reference Bureau statistics that show the area around 19th and Meinecke — about a three-quarter mile radius — has been the scene of eight homicides and 37 nonfatal shootings in 2017. He also made an offhand remark that suggested crime in Milwaukee is worse now than it was 20 years ago. Ald. Nic Kovac then said statements such as Donovan’s fuel misconceptions about safety in Milwaukee. “We need to be more responsible with facts and the way we describe things,” he said. Eventually, Donovan, who also claimed to know for a fact that some full-time city employees carry concealed weapons on the job against city policy, asked his colleagues what the proper response is for someone who is asked to work in an area they think is dangerous. “Very simple: find other employment,” Bauman said. Stamper, who in a press release on Monday called the photo “offensive,” said he walks around the 19th and Meinecke area frequently, never with a gun, and said it is safe. He interpreted the photo as jocular, if not braggadocio, and suggested their decision to openly carry was not about safety. The three men in the photo had not been involved in an altercation with citizens before or after the photo was taken, according to Ghassan Korban, commissioner of the Department of Public Works. The men in the photo were working for American Sewer Services, a company that has done business with the city for 30 years, Korban said. The company is finishing a $1.14 million project on sewer rehabilitation at 11 locations. Korban, who met with the owner of the company Tuesday, said two men in the photo have been suspended and the third was fired. The city of Milwaukee has a policy barring employees and contractors from carrying weapons while on the job, but Assistant City Attorney Katherine Block said that policy is not referenced in contracts. Therefore, she said, terminating American Sewer Services’ contract on these grounds is not advisable. Stamper said he intends to draft a resolution directing the Department of Public Works to develop a policy prohibiting contractors from allowing employees to carry weapons while working for the city. Coggs and Bauman, who is the chair of the Public Works Committee, said they would co-sponsor it. Let’s also not ignore the racist emails received by Alderman Stamper and Alderwoman Coggs as a result of speaking up on this issue.